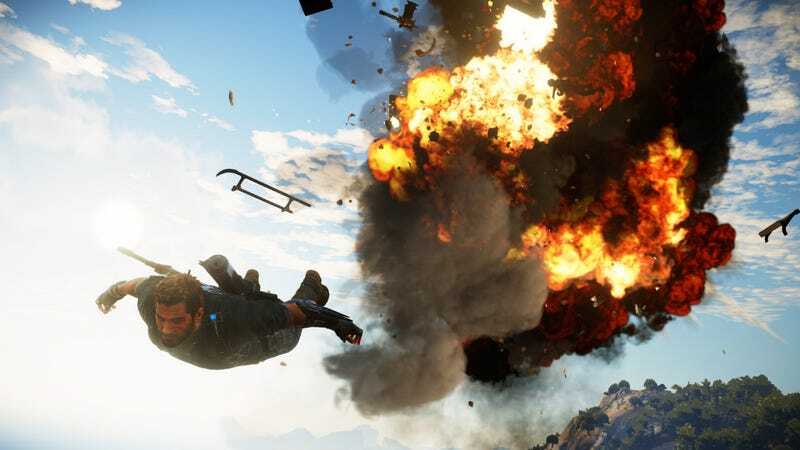 Just Cause 3 is not a complicated game. Most of the time, your mission boils down to ‘go here and obliterate everything’. Enemy structures are even conveniently tagged with red stripes to help guide your destruction, big ol’ bullseyes begging for a rocket sandwich. And there’s no need to worry about collateral damage; protagonist Rico’s pal Mario grants him carte blanche in wreaking chaos, assuring him that the people of Medici will rebuild anything he inadvertently blows up. Quite nice of them, that. The mindless mayhem born of this license to explode can be remarkably relaxing. Turning an enemy base into a pyrotechnic palooza with just a few well-placed rockets is quite the cathartic experience, delivering concentrated hits of destruction-based dopamine directly into the brain. Unleashing hell requires minimal effort; the entire world tests on a hair trigger, with vehicles combusting like they were made of of C4, enemy soldiers spraying bullets with the precision of Imperial Stormtroopers, and an abundance of red barrels positioned to maximise the potency of every blast. It’s not hard to paint the sky with smoke and fire, but it is eminently satisfying. If you’re looking for something a little more mentally taxing, though, Just Cause 3 has you covered there too. Using the game’s trademark tethers and their new retractability function, along with remote explosives, vehicle stunt positions, and the awesome wingsuit, it’s possible to concoct scenarios so bombastic they would make Michael Bay blush. Strapping remote explosives to a jeep, tethering it to a helicopter, then flying in and flinging the jeep like a gigantic cluster bomb into the middle of an unsuspecting military base is ridiculous in the best way possible. The downside to the vast possibility space accessible with the game’s tools is that it depends on self-motivation to achieve its full potential. Coming up with a plan that’s not only feasible but fun isn’t always easy, and experimentation can be time-consuming. Plans often go awry, too, botched by a moment of uncooperative physics or the slightest error in aiming. It’s incredibly disappointing to go to all the trouble of acquiring a heavy-duty helicopter, finding a friendly tank and tethering it up, and carefully flying to the enemy base only for the tip of a tree to brush the bottom of the tank and upset your balance, sending your chopper careening into the ground. That said, sometimes failure can be even more fun than success. Torpedoing a boat up a docking ramp and missing the fuel tank you were aiming for might be frustrating at first, but when you tether the misguided missile to an incoming chopper and the two vehicles twirl around in a comically fast death spiral, annihilating everything that crosses their path, all disappointment is quickly forgotten. For those less interested in devising their own crazy scenarios, Just Cause 3's main story missions deliver some pretty fantastical set-pieces in which to unleash your inner James Bond/John McLane. Whether it be hurling buggies off the back of a speeding train to deter your pursuers, or mounting a last-second rescue of the former-president’s plane just before it plunges into a lake, the premise for each mission is as outrageous as it is exhilarating. The story underlying the lunacy might be nothing to write home about, but the chaos that comes of it creates its own narrative, and it sure is a memorable one. Sadly, in order to tell the most thrilling of tales, it is necessary to upgrade your tools beyond their initial capacity. To do this, you must complete a variety of score-attack challenges that take the form of land, sea, and air races; GTA-style rampages; and even a pseudo-Katamari rock collect-a-thon. In and of themselves, these side quests are perfectly competent - the wingsuit races are especially exciting, as you dive head-first down mountainsides and swoop precariously through tight tunnels scant metres above the roofs of the traffic below. The problem, though, stems from the fact that vital improvements to your gear can only be acquired by hitting high scores on these challenges and earning gears - stars, essentially - which slowly unlock the abilities that allow the game to truly shine. For example, to use more than two tethers at a time - a necessity for anyone with creative ambitions - you must first liberate specific regions - discovered by luck unless you check out an FAQ - then score high enough in their tether challenges to unlock the corresponding upgrades. If you don’t hit the right score, or you don’t discover the right regions, you’re left with a weaker toolset that actively limits the fun you can have. Worse, there are so many tiers of upgrades that to reach the point where the game is no longer withholding its full potential requires a whole lot of jumping through hoops that seem at odds with that the Just Cause serious has been about. Forcing players to grind for the tools that make the game the most fun is a bad idea. Even though I personally enjoyed the challenges, something like an XP or pick-a-perk system would have been a much friendlier way of creating a sense of progression and reward. Unfortunately, a similar inflexibility is also present in the structure of the story missions. For little reason other than to pad the game’s length, the main missions are gated behind the liberation of a set number of enemy provinces. Narratively, it makes sense, but the sheer number of rinse-repeat bases that have to be destroyed to move forward each time is excessive, and the destruction loses its edge when it’s forced, rather than simply encouraged. For all its structural problems, though, the chaos at the heart of Just Cause 3 remains ridiculously fun. The fiery explosions are endlessly entrancing, the mushroom clouds mesmerising even a hundred times over. Dynamic physics ensure that every firefight is unpredictable enough to stay fresh, and the wealth of tactical options reward experimentation with stories worthy of sharing with friends. And the wingsuit! It alone warrants praise for redefining the act of traversal, turning what is often the bane of expansive open-world games into something so enjoyable in its own right that I spent hours just zipping up and down mountains, skimming over the ocean, and swooping beneath bridges for the sheer thrill of it. Without a doubt, the wingsuit is what makes Just Cause 3 for me. While it’s far from revolutionary, Just Cause 3 is a blast. It’s got its fair share of flaws, and it’s not going to win over anyone tired of the traditional open-world formula, but in terms of pure, unbridled fun, it’s got that in spades. Sometimes all you want is to kick back and watch the world burn. For that, you can’t go wrong with Just Cause 3. Could Breath of the Wild Be Too Big?